You are here: Home » Contributors » But You Can’t Find Parts For Those Cars…. But You Can’t Find Parts For Those Cars…. Recently I received a call from a very nice fellow from the East coast who builds muscle cars for a living. He has a high-end shop that has a long list of cars that he’s built for his customers. One of the nicest looking, factory–correct, numbers matching Chevelle’s I’ve ever seen is among the list of examples of his work that he has on his website. The reason he was calling me was due to a frustrating situation he was encountering as he had just taken in a 1969 AMX for a customer that wanted to give the car the full Pro Touring treatment. His biggest complaint was “you can’t find parts for those cars.” I hear it all the time, and it couldn’t be more wrong. 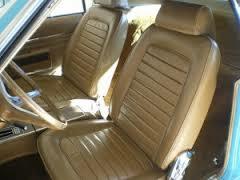 An AMC interior kit. Yes, you CAN get them! My son and I both belong to one of the local Mopar clubs here in Colorado, and we hear it there constantly. Since AMC vehicles have been somewhat “adopted” by many of the Mopar clubs since AMC as a company was purchased by Chrysler in 1987, AMC is kind of considered part of the Mopar family. Since we build and show some high end restorations and a pro-touring AMC or two, the Mopar guys appreciate the cars when they are done well. Some of the Mopar guys have even picked up an AMX or Javelin to fill out their collection, but when we speak with them the old perceived problem comes in with the phrase “You can’t find parts for those cars.” In fact just recently a collector told me he would be building a pro-touring AMX because he loves the style of the car, but because he thought it was too difficult to find parts for them it eventually kept him from taking on an AMC project. 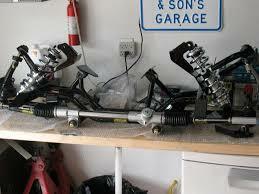 Don’t think there is a coil over setup for AMC muscle cars? Think again! Back to the fellow from the East Coast who had the challenge in front of him of building a pro-touring AMX. He was so frustrated because he couldn’t even find an aftermarket steering wheel for the car. 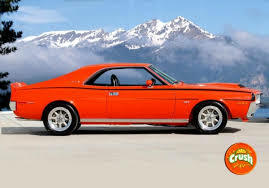 Admittedly, it is not as easy finding parts for an AMC muscle car as a Camaro or Mustang (and you can now buy a complete Dynacorn body for a Mustang, Camaro or Challenger), but it is getting easier for the AMCs. There are far more good reproduction parts available today than there were 10-15 years ago. Today you can purchase really nice reproduction tail light bezels and lenses, glass, sheet metal patch panels for the quarters, trunk pans and floor pans. Also available are side marker lights, dash overlays and parts, seat upholstery, carpets, door panels, door handles; interior and exterior, headliners, reproduction exterior trim and rearview mirrors, and the list goes on and on. In fact even some of the rarest options like rally pac gauges and side exhaust have also been reproduced. Bolt on Wilwood brakes – now for AMC muscle cars! Engine parts are also readily available mostly due to the fact that AMC owned Jeep and Jeeps had AMC engines powering them. The large Jeep market keeps AMC engine development alive and well. Aluminum heads are available from several sources including Indy Heads and Edelbrock. Forged Pistons, rods, and cranks as well as a healthy assortment of aluminum intakes and high performance fuel injection set-ups are all available from various manufacturers as well. A 500 cid all-aluminum AMC block is also available if you need 800+ hp! For suspension components companies like Control Freaks Suspensions (www.freakride.com) create exotic independent coil over front suspensions and 4 link rear set-ups for virtually any AMC. 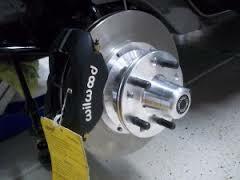 Wilwood Brakes also just got into the AMC game with a complete line of high performance big brakes for AMC. I was happy to help out the fellow building the AMX because the muscle car world is much more fun with variety. I really can’t wait to see the car when it’s done! So, in the end if you’re thinking that maybe a pro-touring AMX, Javelin or Rebel Machine might be in your future, don’t let the phrase, “But you can’t find parts for those cars” be your excuse anymore! How about parts for a 1974 Chev Caprice Classic. I have been looking for the filler trim piece that goes between the bumpers and body. Both front and back.